"Kimberly Township, Aitkin County, Minnesota"
Back row: Leonard Sogard, Minnie Sogard, Anna Midthun, and Mildred Oppegard. Kimberly school district 8 was established in 1892 and classes were held until consolidation with Aitkin 1961. The first school house was a log frame structure. 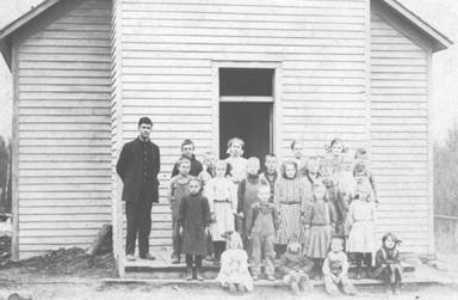 The student body posed here for the picture of the front steps of the second school house along with the teacher, Mr. O’Hara, in 1910. This picture and caption was published in the Aitkin Independent Age on Feb. 2nd, 2002. Photo contributed by Randy C. Wall who also researched the names.